The year 1990 marked Hawken School’s 75th anniversary, a year-long celebration built around the theme “Celebrating Teachers and Teaching” and culminated into the event of the year: a sit-down dinner celebration attended by over 400 people during Alumni Weekend. The Hawken Book, written by William Donohue Ellis and Nancy A. Schneider, was also published in 1990 to commemorate the school’s anniversary. The 1990’s began with Doug Stenberg, the second longest tenured head in the history of the school, announcing that he would be leaving Hawken in June of 1991. The search committee, chaired by Charles P. Bolton, chose Richard Barter from Collegiate School in New York City as Hawken’s next headmaster. Barter was given the following charge: to unify the two campuses; regain control of a faculty-led Upper School; slow faculty turnover; and infuse in the community a more palpable sense of spirit and purpose. Barter rose to the challenge by working not only with faculty members, but with three new committees: Parents and Partners, the Time Committee, and the Curriculum Committee to ensure changes were made. 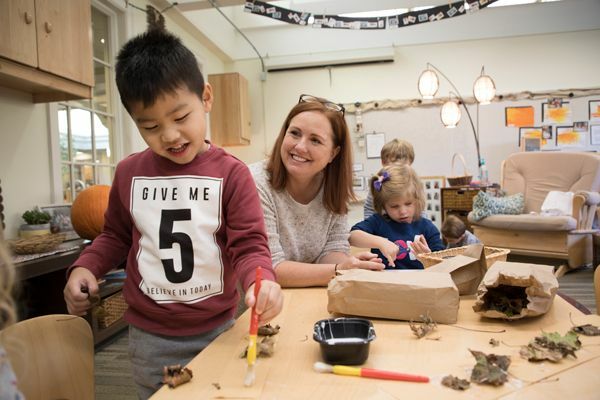 Through the Hawken community working together, the end of the school year in 1997 created successful results in strong endowment, strong enrollment, and the committees continued working to better the school. However, in September of 1997, Barter announced his resignation, effective June of 1998, stating that he had accomplished what he had set out to do by improving the school’s finances, creating a stronger community, and expanding the facilities. Such facilities at Lyndhurst included new science labs, Ingalls Gym, two computer classrooms, large classrooms in the Middle School for activity-based instruction and class meetings, the expansion and renovation of Hochstetler Dining Room, more preschool classrooms, new music facilities, and the addition of a child study center. Developments at the Gates Mills campus included a new science wing, tech center, private faculty offices, and the Arts and Communications Lobby. As Hawken looked toward the 21st century, the School was well-positioned to remain on the cutting edge of the technological boom with its new website—the first one launched among CCIS schools. Jim Berkman began his tenure as Hawken’s ninth head of school in July of 1998. The “real work,” according to Berkman, would be accomplished during the 1999-2000 school year, as the School was ushering in a new millennium.